Stagecoach has become the first UK bus company to mix its own biofuel on site using a new bio-blender installed at its Kilmarnock depot. Currently, the vast majority of Stagecoach’s 8,100-strong bus fleet operates using a mix of 5% biofuel and 95% standard diesel. The new bio-blender will enable buses at Kilmarnock depot to run on a greener mix of up to 40% biofuel and 60% standard diesel. The new initiative follows the launch of the UK’s first bio-buses in Kilmarnock in 2007 – nine vehicles which run on 100% biofuel made from used cooking oil and other food industry by-products. 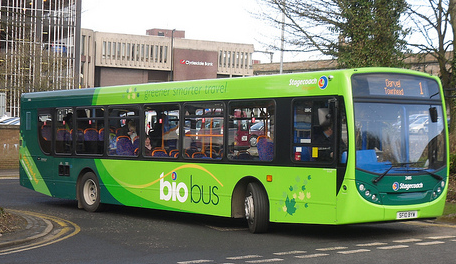 The bio-bus project, which also allows customers to exchange their used cooking oil for discounted bus travel, has reduced CO2 emissions from the vehicles by 80%, saving more than 2450 tonnes of carbon. More than 70 tonnes of used cooking oil has been recycled at East Ayrshire Council’s recycling plant since the start of the scheme. The blended biofuel will be used in vehicles serving routes in Kilmarnock and Irvine as well as Service 11 to Ardrossan and express services to Glasgow. The bio-blender initiative is the latest in a string of measures being taken by Stagecoach to reduce its carbon footprint as a business. The Group is targeting an overall reduction of 8% in buildings CO2 emissions and a cut of 3% in annual fleet transport CO2e emissions by 2014. 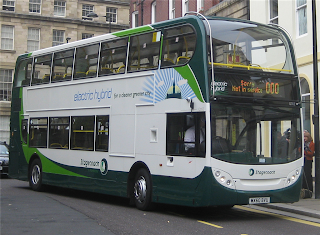 Recently, Stagecoach launched a fleet of 11 buses in Lincoln that operate on biomethane, derived from household rubbish and animal waste and could reduce carbon emissions by up to 40% as well as cutting fuel consumption. The company has also announced a multi-million-pound investment in a hi-tech eco-driving system, by Green Road, which is expected to reduce fuel consumption at its bus division by 4%. The scheme also offers employees the chance to earn “green points” that are converted into financial benefits from a potential £900,000 annual bonus pot. Stagecoach are soon to launch new Enviro 400H hybrid vehicles at their Newcastle upon Tyne and Sheffield operations, following last years successful bidding for funding from the Green Bus Fund.